My plan once I got off the 222 at Jackson Square was to take the Commuter Rail one stop from East Weymouth to Weymouth Landing in order to catch the 225. And not just any 225 - I wanted the weekday-only variant that goes all the way down to Columbian Square, doubling the route length. But alas, right as I walked up to Quincy Ave, a bus was going by. Disappointed, I figured I'd just get a bus back to Quincy Center - but wait! Something was coming down the road! It was...yes, the 225C to Columbian Square! I rushed across the street and hopped aboard the bus. The bus was already pretty crowded when I got on, but luckily there was a free seat pair. We headed down Commercial Street, then turned onto Front Street, leaving the businesses of Weymouth Landing behind. Front Street was almost entirely residential, and the houses continued when the road became Summer Street. We eventually reached an intersection with an apartment building on the corner, and here we turned onto Federal Street, rejoining the main route at Washington Street. Skipping ahead a bit (a lot), here's the bus at Columbian Square. To make the post a bit more fluid, I'm going to skip ahead to Columbian Square now and cover the journey all the way back to Quincy. The bus laid over on Columbian Street, right next to the massive South Shore Hospital complex. Leaving the generic street stop, we headed down the street, passing a movie theater. We then turned onto Pleasant Street, passing some businesses, then we swerved onto the residential (and wide) Main Street. The houses weren't around for long, though, as Main Street got even wider and we went by the South Shore Hospital again. Continuing north, there were some businesses with big parking lots in front of them, then the street went back to a normal size and the houses came back. Hey, there's a water tower in the distance! And...lots of cars. Oh, but that reprieve didn't last long. The street eventually widened once more, culminating in a huge suburban intersection. At this intersection, we turned onto Middle Street, which thankfully got narrower and residential. We crossed over Route 3, and the street started winding a bit, still lined with houses. No parking? Well, I can see why, given that monstrosity behind you. But alas, we arrived at a big suburban shopping plaza with a huge parking lot. The street grew wide again, with a huge intersection surrounded by malls and parking lots. We turned onto Washington Street here, passing a cemetery, then a BJ's and some more parking lots. It started to get more industrial, with auto shops to go along with the big box stores and fast food restaurants. It was at this point that the inbound and outbound routes split. I talked about the residential outbound route at the beginning of the post, so now here's the more commercial inbound route. It was pretty straightforward, actually, since we just continued up Washington Street. As we went on, the businesses got more cozy with smaller parking lots, which culminated on Commercial Street, the main drag of Weymouth Landing. It's worth noting, by the way, that all non-Columbian Square trips (the majority for the route) use the inbound-outbound split here as a loop to get back to Quincy. Crossing over the Monatiquot River. I have no idea how to pronounce that. We made a slight curve onto Quincy Ave, going by the Weymouth Landing Commuter Rail station and entering Braintree. We then went on a small bridge over the Monatiquot River, with houses on the other side. However, it soon got industrial, with auto shops and gas stations on both sides of the road. And this is where things start to get confusing. See, there are three different ways the 225 can go through the next section of the route. I'll describe the one my bus took first, which is the "default" route, continuing down Quincy Ave. Right, so when I said it was "industrial" before, I meant light industry, with a few auto shops here and there. But as we headed further down Quincy Ave, it became proper heavy industry, with huge vats of oil on the side of the road. A massive unpaved, undeveloped swath of land lined the right side of the street. A train track crossed the road, with huge oil freight cars in view. And yet there were still auto shops and fast food restaurants in between all this! We then turned onto East Howard Street, which continued to run along the industrial area. From there, we turned onto Desmoines Road, and that became South Street. After going under a walkway between two apartment buildings, we turned onto Southern Artery, then...another South Street? I don't know, but it was lined with houses until we reached Quincy Ave again. Actually, this apartment complex seems like it's still under construction. However, every other 225 skips the industrial portion in favor of a different route. Coming from Quincy Ave, this variant turns onto Hayward Street just before the industrial area. It then turns onto Shaw Street, which is lined with houses. When it becomes Howard Street, though, it gets industrial, at least on one side. The other side has a housing development. At the same intersection where the regular route leaves Quincy Ave, the Shaw Street variant turns onto Quincy Ave. Along this section, it's mostly businesses with large parking lots out front, and these basically stretch all the way to where the regular route rejoins the street. The third 225 variant is only for a few early morning and late night trips, and that one just stays on Quincy Ave the whole time. Anyway, now that all three route variations are back together, let's continue with my ride! Joining back with Quincy Ave, it was lined with businesses and parking lots, Luckily, though, it became Hancock Street, and we entered Quincy Center. Now the street was lined with retail that was a lot more interesting. I was assuming we'd continue up Hancock Street to get to the Quincy Center busway, but that's not what we did. Instead, we turned onto Granite Street, then swung a right onto the Thomas E. Burgin Parkway, arriving at Quincy Center Station on the other side. This other stop had its own announcement and everything! Is this inbound routing exclusive to the 225 or do other routes do it too? Let me know, because I'm rather curious as to why we didn't just go to the busway. Ridership: On weekdays, this is the busiest Quincy bus, with an average of 3,058 riders. It's not quite as busy on weekends, when commuters aren't relying on the route, but it still gets an average of 1,335 riders on Saturdays and 653 on Sundays. My outbound trip when I got on at Weymouth Landing had 30 people on it already, while my trip back only had about 15 (since I was going inbound during the evening rush hour). However, I saw buses going the other way that were absolutely packed. Pros: The 225 evidently runs on an extremely busy corridor, considering how much ridership it gets. The route serves a pretty dense part of Braintree, and if it's going down to Columbian Square, a huge swath of Weymouth. Plus, it's quite frequent, running every 10 minutes during rush hour, every half hour during the day and on Saturdays, and every hour nights and Sundays. 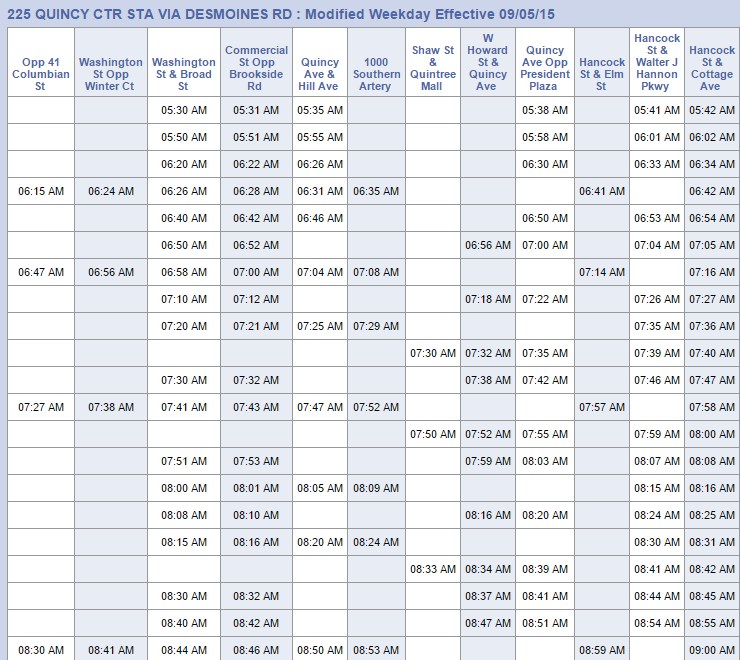 Okay, every hour isn't great, but this is a Quincy route, so weekend ridership is significantly lower than during rush hour. Nearby and Noteworthy: Okay, okay, so I know I spent the first half of this post complaining about big parking lots. Look, big malls aren't my thing. I understand that that's what people need in the suburbs because they need to drive places, but I'm just not a fan. Thus, I didn't like Columbian Square too much, except for that movie theater. Weymouth Landing seems like a much more interesting place to me. Do you remember that survey the MBTA ran to choose the designs for its new vehicles? Well, after a bit of an issue with ballot stuffing, the winners were announced! See them here. not to be confusing but when in Weymouth Landing going towards Columbian sq the side that the door of bus is on is WEYMOUTH and is Washington St while the businesses or what's left of them is BRAINTREE and that side of street is Commercial st . Which makes the Commuter rail st in East Braintree. Its Quincy Avenue not Street. you are in Braintree as soon as you go over the rail road tracks by the old Quincy Shipyard. Quincy Ave goes from Oral Surgery South at 24 Quincy Ave all the way to the lights by the Commuter rail Station in EAst Braintree. 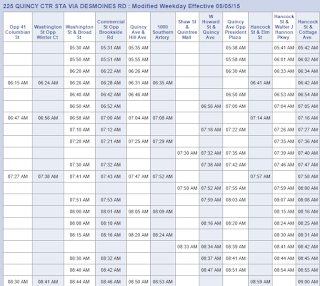 the is aslo 2 variations not mentioned the 5:10 , 5:10 and 5:55 all go straight Quincy Ave same thing on Saturday am's the first few trips all go straight down Quincy Ave. late night the buses do the same thing go straight there is also a couple of short trips that go as far as Shaw St and West Howard St and turn back to Quincy Center around 5=30 p and somewhere in the 6pm hour. Thanks for all the info! I've fixed the naming errors you pointed out. Also, the fact that the early Columbian Square trips are heavy just seems to be more evidence that they should extend more trips out there!